The sprouted rye bread we bake is modeled after the rye bread we've eaten for years in Denmark. Our version is naturally leavened (thanks to our strong sourdough starter José) and made from the best ingredients around. Pick up a fresh loaf at our restaurant or at Rainbow Grocery or Douglas - Café and Corner Market. You can also get our sprouted rye loaf delivered through GoodEggs or Instacart - see links below. 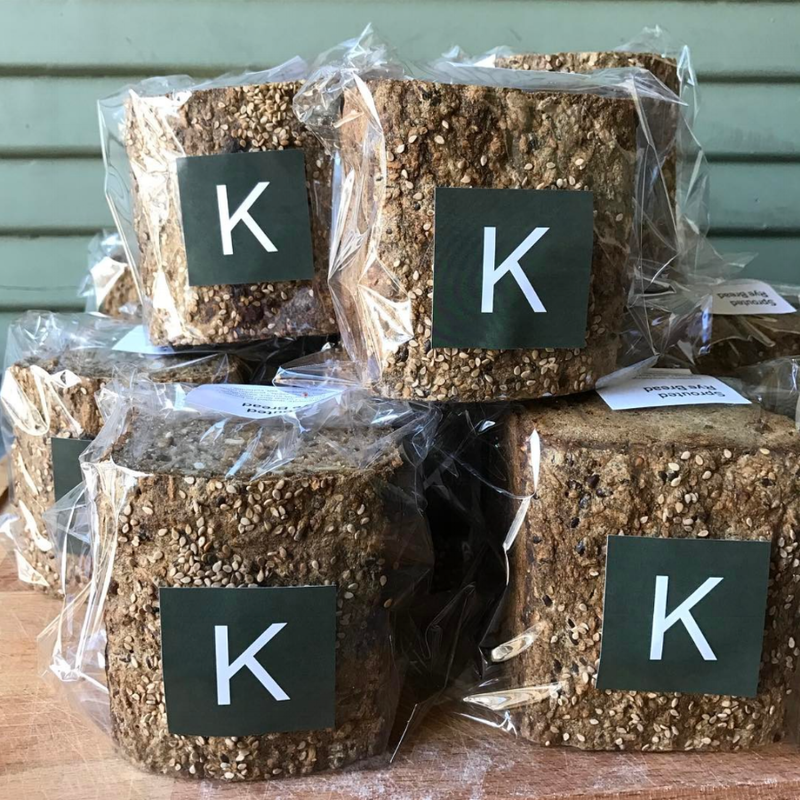 Email us at hello@kantinesf.com if you'd like to pre-order large quantities or full (longer) loaves of our bread. ** Instacart, online grocery delivery, direct from Rainbow Grocery. Ingredients: sprouted rye berries,* rye flour,* wheat flour,* malt syrup, malted barley extract,* sunflower seeds,* flax seeds,* pumpkin seeds,* sesame seeds,* salt, buttermilk (* = organic). The bread is naturally leavened with a sourdough starter - no added commercial yeast. Common allergens include wheat, milk and sesame. Wholesome ingredients keep this bread fresh at room temperature for a few days or for over two weeks in the refrigerator. We like to give it a quick toast, if it has been refrigerated. The packaged unsliced bread is sold in 17oz. chunks. Serving suggestions? We like cutting the bread into 1/4" thick slices and topping it with cured fish, sliced meat, cheese, fried egg or avocado. Or try just giving it quick toast and a slather of good butter and honey!